There is nothing more disgusting than a dirty bathroom. The problem is that bathrooms get dirty very easily but it is very hard to clean them especially tile grouts. Although there are tiles without grout it is very dangerous to lay tile without grout because the tile will prematurely crack. So, we can understand how tile grout is very essential for our house. But that doesn’t make them any easy to clean. Without any further delay let’s learn about how to clean tile grout in the shower. Tile grouts are usually used in kitchens and showers. Ironically these two places get dirty easily. So, tile grouts in the kitchen and the shower need to be cleaned properly and often. Because it is such a small space regular vacuuming just can’t do the job. So over time dirt piles on making tile grouts dirtier and more unappealing. So not cleaning tile grouts is quite unhygienic really. If we do not clean tile grouts then our entire floor looks dirty and nobody wants that. So maybe once or twice a month we can properly clean our tile grout. It is better to clean your tile grout when you are deep cleaning your apartment or house. That way you don’t have to put any extra effort to it. If your tile grout is new and not that dirty then you don’t have to stress too much but if your tile grout is old and very dirty then you need to work a little bit harder. Even though it will cost you physical labor it shouldn’t cost you too much money. ​Tile grouts in the shower gets dirty very easily because we use our bathrooms every day sometimes even multiple times a day. The constant usage of water in shower can leave marks on tiles. If the shower is not cleaned properly the tiles can be quite slippery and dirty. If the shower is slippery then people can fall down and injure themselves. Tile grouts in the shower can look quite ugly if they are not cleaned properly. Also, if the shower is not cleaned it can reek of smell. So, shower tiles need some special cleaning. Another thing that happens in the shower that residue from soaps and shampoos can discolor tiles. That also creates a lot of problems. That’s why tile grouts in the shower gets dirty easily. ​A lot of people don’t have the time or patience to do DIYs so they can buy store brought cleaners to clean their showers. There are a lot of different types of cleaners in the market. Some cleaners have harsh chemicals, some cleaners are biodegradable and more environment- friendly. So, choose any cleaner according to your needs. To clean the grouts put the cleaner between tile grouts and wait ten minutes. After ten minutes take a wet sponge and start rubbing. The dirt should be easy to remove and tile grouts will be cleaned. You can take any kind of store brought cleaner to use this method. But be careful because some cleaners are dangerous to use if you have children or pets. So, make sure to check the label before buying any products. It is wise to buy products with less chemicals. If you do not want to buy cleaning products from the store you can make your own cleaning products using what you have at home. There are pros and cons of doing this. Pros are that it is cheaper. If you buy cleaning products from the store it will cost you quite a lot of money based on what kind of product you buy. But making your own product at home will not cost as much. Also, you know what is in your cleaning product if you make it at home. Most of us don’t even know half the chemicals written on the back of a cleaning product. It is also probably good for the environment if you make your own cleaning product because there is less packaging. 1. First you need some warm water and liquid soap. Mix the water and soap together. Use a sponge to clean your tile grouts. Be sure to clean every nook and cranny of your shower. Most of the time we neglect to clean our shower properly. This way bacteria and mold grows inside the shower. To prevent this clean every bit of tile grout in your shower. If you have glass around your shower clean that too. It is recommended to change your shower curtain every six months. 2. If your shower grouts can’t be cleaned with just soap and water you need something stronger. Take a glass bottle pour vinegar halfway through, fill the rest of the bottle with water. Now spray this mixture on your tile grout and wait a few minutes. After a few minutes take a sponge and start rubbing. Your tile grout should start becoming cleaner. Vinegar is acidic, so it is more functional than just water and soap. Vinegar can also be found in every household. So, using vinegar is very cheap and easy. 3. All of the methods listed above are for mildly dirty tile grout. But if your tile grouts are really filthy you need something stronger. First of all, take some baking powder and generously spread it across the floor. Take some vinegar and water mixture and spray it over the baking powder. Take a sponge and start rubbing. All the grease and dirt should be easily removed. Then wash the residue off with water. Baking soda and vinegar reacts together and creates a salt. During this process a lot of free hydrogen ions are released which helps to clean the tile grouts. 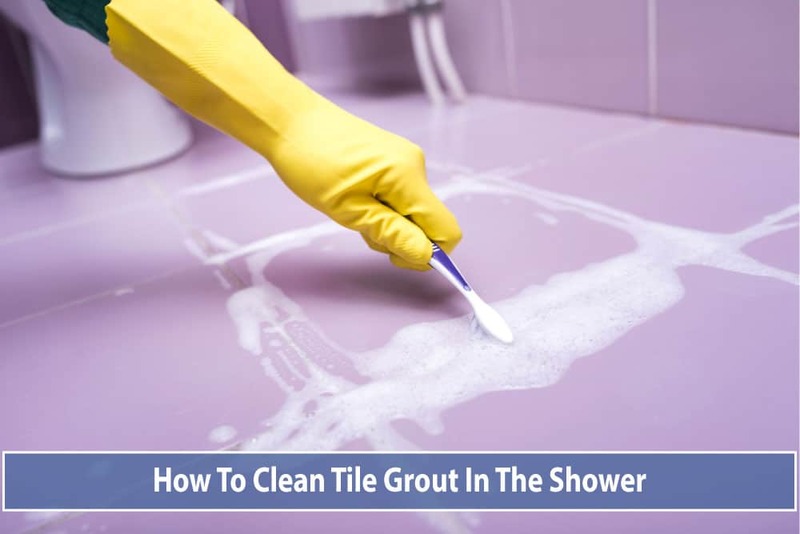 Using this method, you can clean your tile grouts very effectively. 4. This method is the strongest o them all. So, if your shower grouts are really dirty you can use this method. Mix one-part hydrogen peroxide one-part baking soda and one-part dish soap to make a paste. Take an old toothbrush and put the paste on it and start cleaning the tile grouts. In this method you will clean the tile grouts individually so it will take a lot of time. But it is the most effective way to clean your tile grouts. Hydrogen peroxide is a natural whitener and cleaner so it will easily remove all the stains. Just don’t over use it. Remember if you tile grout in the shower is very dirty then it may take a few washes to properly clean it. Don’t be disappointed if you cannot see the result on the first try. Just keep trying. You will see the result sooner or later. The method of cleaning tile grouts in the shower are given above. Of all the points discussed choose one that suits you the most. If you are a busy person who does not have a lot of time but you like to keep your house clean then the store brought cleaners are the best option for you. They are cheap, works efficiently and you don’t have to put a physical strain on yourself. On the other hand, if you have a lot of time on your hand and you like to do DIYs then you can make your own cleaning products at home. They may not be as effective as the store brought ones but at least they are eco- friendly. The only down side is that you have to put in a lot of physical labor. But it can be a good exercise. At today’s day and age we have a lot of option on our hands. So, we can judge each method and try for ourselves what works best for us. So, if you are unsure which method to use to clean tile grouts in your shower, try them all and see for yourself. Only then choose which one works best for you. Based on our income, life style and cleaning habits we can all find a method most suitable for us. Hope you find all this useful.